February 25, 1956 - Tracked from Richland County into Northern Lawrence County, dissipating near Pinkstaff. The tornado did about $2.5 Million in damage, mainly in Pinkstaff and injured 2 people. 1. 2/25/1956: This tornado developed near Olney (Richland County), moving 20 miles before lifting in Northern Lawrence County East of Pickstaff. The worst damage was at Pinkstaff. 3. 5/3/1958: This tornado was on the ground for 3 miles. Damaged 2 farmsteads 7 miles Southeast of Sumner. 4. 4/19/1963: This tornado touched down 7 miles Southwest of St. Francisville in Wabash County, then clipped extreme Southeast Lawrence County before moving into Indiana. Ten people were injured overall in Illinois, with 100 buildings damaged or destroyed. 5. 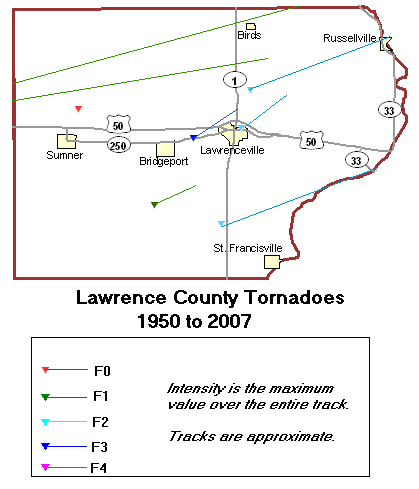 5/6/1971: This tornado touched down 6 miles South of Lawrenceville, destroying several farm buildings. 6. 4/1/1974: This tornado first hit Bridgeport, destroying a bus barn and damaging a few houses. It lifted briefly, then touched down again on the North side of Lawrenceville, damaging two mobile homes. one person was injured when a tractor was dropped on his leg. 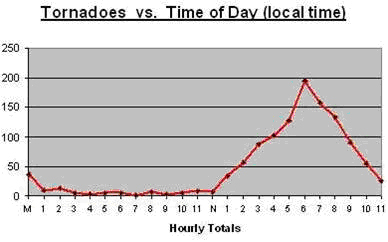 The tornado briefly lifted as it crossed the Wabash River, then touched down again in Knox County, Indiana.